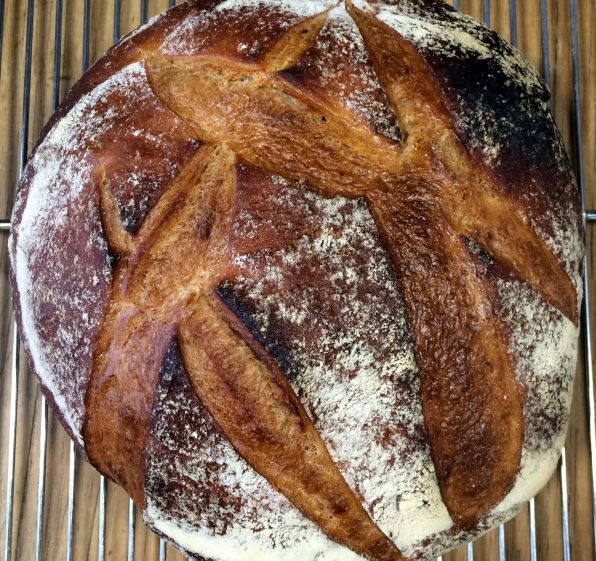 Steam in the oven during the first few minutes of baking bread has many benefits. The moist steam reinvigorates the yeast in the dough. Steam gives bread dough time to expand: the added moisture keeps the dough from drying out before it has time to rise. Steam also produces bread with a thin, chewy crust and seductive shine, what you see in the loaf of country wheat bread pictured here. Breads baked without steam may have an irregular shape and an unpleasant thick crust. When you think like a baker, you know the importance of steam in the oven during baking. Here are some tricks for getting a chewy crust on your home baked bread by using steam in your oven. To create steam in a home oven, place a small pan of water in the bottom of the oven. A small cast iron pan is a good choice. It retains heat and the water that is poured into it turns quickly into steam. We carefully toss about ½ cup of boiling water into the heated pan right before sliding bread onto the baking stone. 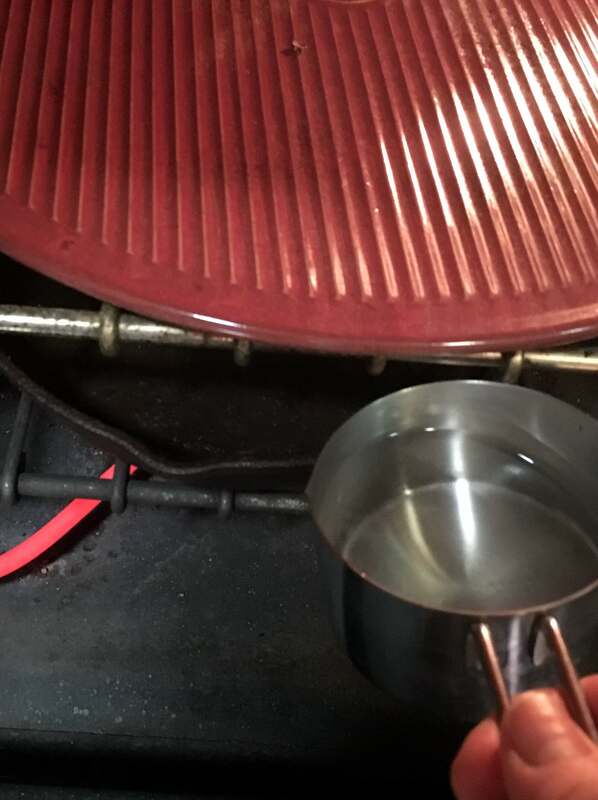 (We use our electric water kettle, which also heats water for my tea.) The small amount of water evaporates within 4 or 5 minutes, just enough time for the dough to quickly swell to its full volume. Some people toss ice cubes into the heated pan. It’s easy, but think of the time it takes for the ice to melt then heat up to 212°F before there is any steam. That’s enough time for your bread dough to crust over. Misting loaves or the inside of your oven with a spray bottle rarely produces enough steam to make a difference. In order for bread to brown, the oven must be dry. It’s important to use only enough water to create a burst of steam early in the bake. A small amount of steam at the start of a bake benefits other types of baked goods too. I steam the oven when I bake muffins or quick breads made with chemical leavening (baking powder and baking soda) too. For crusty boules we use a baking cloche from Emile Henry. 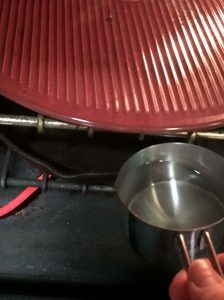 There is no need for a pan of water on the bottom of the oven or for a baking stone. A cloche replicates the conditions found in a traditional dome-shaped wood oven. The cloche, from the French word for bell, covers the dough while it bakes. Moisture in the dough is trapped under the cloche. It turns to steam, which keeps the bread dough moist during baking. The dough expands, swelling into a plump loaf of bread. Once all of the moisture evaporates, the bread begins to brown. A small amount of steam during the last few minutes of baking or as soon as you take your bread out of the oven can give a nice shine to the surface of bread dough. Here is where that spray bottle of water comes in handy. Spritz the bread lightly and watch the surface develop a nice sheen.